Benjamin Netanyahu: You are ambassadors of truth. You're not merely the greatest ambassadors that Israel has around the world, you're champions of truth. If there's one thing that I can ask you to do it's to tell the truth. Tell the truth about our history, tell the truth about our present, tell the truth about who wants peace and who doesn't want peace. Steve Conover: The apostle Paul in Romans 10 said, "How are they to call on one they have not believed in? And how are they to believe in one they have not heard of? And how are they to hear without someone preaching to them? And how are they to preach unless they are sent?" Paul is saying that communicating the truth of the gospel is of utmost importance. The message of Jesus the Messiah must be heard. Hi, everyone. This is the Friends of Israel Today and I'm Steve Conover. Chris Katulka: And I'm Chris Katulka. Today is our ministry highlights episode, where we highlight one of the many Friends of Israel ministries that are happening all around the world. Now, for our last ministry highlight episode of 2018, we wanted to focus on a ministry that's really near and dear to my heart, and it's what you're listening to right now. It's this ministry. It's the Friends of Israel Today radio program. 27 years ago Dr. Elwood McQuaid started our radio ministry on just six stations and thanks to his vision to share God's Word on the radio, we're now on more than 500 stations around the US and Canada. Plus, our podcast that's listened to all around the world. Our radio program desires to fulfill what Paul was talking about in Romans 10, what you just heard from Steve, to preach God's Word and the truth about Israel and the Jewish people. Recently I represented our radio ministry when I traveled to Israel to join other Christian broadcasters and journalists who love and support Israel. And I want to share with you some of my thoughts about my experience. Steve Conover: First, the Christian media summit you attended actually made international headlines. In a show of solidarity, Israel's government press office hosted 180 influential Christian broadcasters from all over the world for a four-day summit. Christian journalists heard from leading Israeli officials like President Reuven Rivlin and Prime Minister Benjamin Netanyahu. The goal was to show Christian journalists the truth about Israel in hopes that they will continue to communicate that truth to their Christian audience. Chris, you attended this summit; did they accomplish their goal? Chris Katulka: A hundred percent. I was really encouraged by the Christian media summit, and it was an honor to be invited by the Israeli government to be part of this and to really rub shoulders with other Christian broadcasters and journalists who love Israel and support Israel. And I know the reason why Israel's doing this. Back in the 80s during the First Intifada, there were many allies of Israel that became highly critical of the Jewish state. The only ones that weren't fair weather friends of Israel were evangelical Christians. And I'm going to tell you something: Israel has not forgotten about that. And the Christian media summit was really a way to promote, for Israel, it was a way to promote and advance the special relationship evangelical Christians have with the state of Israel. Chris Katulka: Our entire show can be dedicated to the work our Friends of Israel representatives do all around the world, from building bridges between the Jewish community and Christian community through our Thank God for Israel days right here in the United States to our medical clinic in Buenos Aires, Argentina, from our work in Poland running Bible camps for Jewish and Christian kids to our church plants in Israel. The Friends of Israel is busy serving the Lord and making the Messiah known all around the world. But one of the ministries I'm very proud of, one that matters a lot to me, is this one right here. That's right, the one you're listening to right now. The Friends of Israel Today. It's a vibrant ministry of the Friends of Israel that seeks to communicate the mission of our organization, which is to communicate biblical truth about Israel and the Messiah while fostering solidarity with the Jewish people. And my friends, that's what I strive to do on this program: to teach biblical truth. To share what God's Word has to say about Jesus, about the Jewish people, and about Israel. And yet at the same time, we often have leading officials from Israel to share about what's happening in the Holy Land, building that solidarity with our Jewish friends. The Friends of Israel Today is such an important ministry to me that reaches out all around the world, like we said earlier, through our 500 stations in the US and Canada and through our podcast that's listened to all around the world. Recently the Israeli government invited me to a special conference in Jerusalem hosted by the Israeli government press office, and the conference was called the Christian Media Summit. Christians who minister in the realm of media and journalism were invited to hear from leading officials like Nir Barkat, the mayor of Jerusalem, Knesset members like Tzipi Hotovely and Michael Oren and Yuli Edelstein. We ate lunch with Israeli president Reuven Rivlin, and we heard from US ambassador David Friedman and Prime Minister Benjamin Netanyahu. And I wanted to share with you some of the things he had to say about Christian media and about you, our listeners. Really, this is not just about what the Friends of Israel does through our radio ministry; it's about you as well. And Prime Minister Netanyahu was speaking right to you, so let's take a listen to cut one. Benjamin Netanyahu: You are ambassadors of truth. You're not merely the greatest ambassadors that Israel has around the world, you're champions of truth. If there's one thing that I can ask you to do it's to tell the truth. Tell the truth about our history, tell the truth about our present, tell the truth about who wants peace and who doesn't want peace. And I think you can also tell the truth about something else. Israel is a robust democracy. It supports and protects the rights of all, the rights of Jews, Christians and Muslims, of all. And we are the only ones who do so in a very broad radius. Chris Katulka: Did you hear what Prime Minister Netanyahu said about you? You, my listeners, are ambassadors of truth for Israel. It's easy to get behind what Prime Minister Netanyahu is calling us to do. He's not asking us to raise funds for Israel. He's not asking us to convince people to think otherwise about Israel. He's simply asking that we tell the truth. Truth-telling was the theme of the night, because sadly, Israel's neighbors in the Middle East don't tell the truth. And oftentimes mainstream media doesn't tell the truth about Israel. And I'm always struck how emotional Israelis get when they find out they have Christian friends around the world who care for them and who understand the truth about Israel, past, present, and future. They get emotional because they read what journalists write about their country and it's just not true. And they read about the animosity people have towards Israel and the Jewish people, and it concerns them. So when they meet a Christian who does love them and support their right to exist, they get emotional, because truly they feel isolated and alone in the Middle East. Prime Minister Netanyahu also mentioned that Israel is a thriving democracy that protects the rights of Jewish people, Christians, and Muslims. Netanyahu continued his conversation with us in the Christian community in Israel, and I want you to take a listen to cut two. Benjamin Netanyahu: I think there's something unusual for Christians, because Israel is the only country in the Middle East where the Christian community thrives and grows, and that is also applicable to what happened in the Palestinian authority areas. You know the town of Bethlehem? Yes. You have a connection to it. We all do. And among other things, we have a connection to King David, the story of Ruth, as you know, but also, also the story of Jesus. Now, when we handed Bethlehem over to the Palestinian authority, its Christian population was roughly 80%. You know what it is now? It's about 20%. And that change happened because in the Palestinian authority areas as well as throughout the Middle East, Christians are being constricted. They're being pressured. Often they're being persecuted. Israel is the one country that protects the human rights of all. We protect the religious sites of all. We don't just protect Christian religious sites. We protect Christian people. Christians should enjoy all the freedom to worship as they please in the Middle East and anywhere else, and the only place in the Middle East where they can do so is Israel. We have no better friends in the world than our Christian friends, and I take this opportunity to thank you for your steadfast support. You are standing up for Israel and you're standing up for the truth, and we stand up for you. Chris Katulka: Christians are truly suffering in the Middle East. In Egypt, Coptic Christians make up only ten percent of the population, and these Christians are often targeted by radical Islamic terrorism. In Iraq, the Christian population has dwindled precipitously since the fall of Saddam Hussein and the rise of ISIS. Christians either fled or they were forced out. And in Syria since the civil war began in 2011, more than one and a half million Christians have fled. Churches have been destroyed and a large number of Christians have either been abducted or murdered. The Middle East is the birthplace of Christianity. Out of Jerusalem, the gospel spread to Damascus and Syria, to Antioch and Turkey and to Alexandria in Egypt. And yet today, these once thriving Christian communities have been absolutely decimated. And Prime Minister Netanyahu gave a perfect example on the Middle East Christian community's decline right in Bethlehem. When Israel had control of Bethlehem, the Christian community thrived. But since the Palestinians took control of Bethlehem, the Christian community has drastically declined. Listen, Israel is the only country in the Middle East where a Christian community is thriving and protected. At the Christian media summit I attended, I heard from an Israeli Arab Christian woman who lives in Nazareth. She and her husband started a company called Alpha and Omega after graduating from Israel's prestigious school, the Technion. The company produces a line of products trusted by neurosurgeons and neuroscience researchers all around the world. And even with social obstacles, Israel provided this amazing woman and her husband the freedom as Christians and Israeli citizens to worship as they wished and to go to the school of their choice and to build a successful global company. Folks, as Prime Minister Netanyahu said, "Just tell the truth about Israel." There is nothing to cover up. There is nothing to hide. Now, when we come back, I want to share what Ambassador David Friedman said to our group, so be sure to stick around. Chris Katulka: We're in the middle of our ministry highlights episode, where we are excited to share about all of the ministries happening with the Friends of Israel. It's a global ministry. There are things happening all the time all around the world as our representatives are showing and sharing the love of the Messiah in Jewish communities all around the world. And I'm excited to announce our latest gift catalog that came out, our 2018 and 19 gift catalog. Ways that you, our listeners, can find out how you can partner with the Friends of Israel. How you can become a partner of the work that's happening globally. There's 24 different ways that you can partner and give. Really, when you open up this gift catalog, it's a trip around the world in all the different programs that we do, from our medical clinic in Argentina to our children's camps in Poland, our church plants in Israel, and our Thank God for Israel Days right here in the United States and Canada. 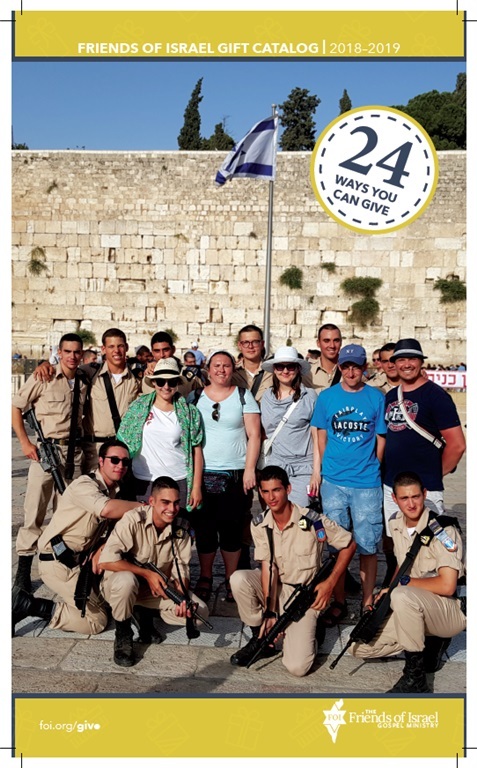 I want to encourage you to get your latest edition of our Friends of Israel gift catalog. You can do this by going to foiradio.org. There you can either download the gift catalog or you can request to have one sent to you. Again, that's by going to foiradio.org. Chris Katulka: Welcome back, everyone. Today is our ministry highlights program, and as I mentioned earlier, I recently returned from Israel, where I was honored to sit and hear from many leading Israeli officials, like Jerusalem Mayor Nir Barkat and Benjamin Netanyahu, Prime Minister Benjamin Netanyahu, who we just heard from in our earlier segment. And now I want you to hear from a surprise guest. When I was sitting there, I was waiting for Benjamin Netanyahu to come out, which was really exciting, but I didn't know that US ambassador to Israel, David Friedman, would show up. I didn't realize that he would be there, which was really exciting. He sat only a few rows from me, and Prime Minister Netanyahu gave him a few moments to talk, and so I want you to listen to Ambassador Friedman, welcoming all of us to the city of Jerusalem. David Friedman: Welcome to the city of Jerusalem, the eternal capital of the state of Israel. Now here's what's really incredible. Ten months ago, I could not say that. Ten months ago a United States government official could not have gotten up anywhere in this country, the United States, anywhere else in the world, and stated the obvious and undeniable truth that Jerusalem is the capital of Israel. Just couldn't do it. Not ten months ago, not 11 months, not ten years, 20 years, 50 years ago. It could never have been done until ten months ago on December sixth of 2017 when President Donald Trump courageously stated the truth boldly, unambiguously, that Jerusalem is the capital of the state of Israel. In his own words on that historic day, President Trump said, "Today we recognize the obvious: that Jerusalem is Israel's capital. This is nothing more or less than a recognition of reality." We've come a long way, haven't we, over the past ten months? Chris Katulka: When we heard from Prime Minister Netanyahu, he made truth the theme of his message. And Ambassador Friedman is going to pick up on this theme too. Folks, Jerusalem has always been the capital of Israel. It was the capital of Israel during the days of David. It maintained its significance through the days of Jesus, and even after the Jewish people were exiled out of the land, groups of Jewish people would always attempt to make Jerusalem their home through history. Jewish people have longed for Jerusalem in the Diaspora, and when Israel became a state in 1948, they declared Jerusalem the capital of Israel. It's the reason their parliament is there. It's the reason the supreme court is there. Anything that has to do with Israeli politics is hubbed in Jerusalem. So it's a truthful statement, as we're talking about this theme of truth, telling the truth, it's just a truthful statement to call Jerusalem the capital of Israel. Any country ... think about this. Any country that doesn't, and many don't, are lying to themselves, and they're just not telling the truth. Jerusalem is the capital of Israel. It was, it is, and it will remain to be. And that's why Ambassador Friedman takes the opportunity to let the Christian crowd that he was speaking to know, even though he's an observant Jewish man, he respects the teachings of Jesus. Listen to what he says here in cut four. David Friedman: I believe all of you know I am an observant Jew. Which means that my biblical observance ends at the books of Ezra and Nehemiah. But while I do not observe in a religious sense the teachings of the New Testament, I'm quite fond of many of its insights and what it has to say. None more so than the statement from the book of John, chapter eight, verse 32, which says, "Then you will know the truth, and the truth will set you free." How brilliant is that assessment? The truth has and will continue to set us all free. But in the 21st century, with all of its transparency and visibility and openness in a 24-hour news cycle and a never ending invasion of social media, are we getting any closer to the truth? Are we perhaps growing ever more distant from the truth? Chris Katulka: I think Ambassador Friedman is spot on here. In a world where knowledge, transparency, and social connectiveness is but a click away, we seem to be getting further and further from the truth. It seems like today, the knowledge, the transparency, and the connectivity are actually stifling truth. And in the passage in John 8, the one that Ambassador Friedman quoted from, Jesus is saying this: The truth that will set you free is the truth that He is the Messiah. That's the real truth. And Ambassador Friedman ends his message with an exhortation for all of us, you and me, so take a listen to this. David Friedman: The challenge today to provide honest and fair reporting and to transmit a message of faith, of morality, of optimism, is greater than ever before. And all of you are on the front lines of this mission, charged ... charged with the sacred task of conveying the truth to an audience which thirsts for the truth and seeks meaning and purpose in this turbulent world. I will say this again for emphasis. Yours truly is a sacred task. Chris Katulka: Folks, to tell the truth is a sacred task. I love what he said about the purpose of Christian journalism today. It's more than just Christian journalism. It's the Christian life. We're to bring a message of faith, morality, and optimism. Did you hear him say that? Isn't that what the message of the gospel's all about? Faith in the life, death, and resurrection of Jesus the Messiah and how that faith changes us through the work of the Holy Spirit in our lives, encouraging us to live lives that are pleasing to the Lord, anchored on the hope of His coming again. And friends, you and I carry a message that just changes lives completely. And let me remind you, our tag line here at the Friends of Israel Today radio program is "Biblical truth for changing times." We believe biblical truth matters. And as this world changes, God's truth remains the same. It remains the same when it comes to His Word. It remains the same when it comes to the message of the Gospel. It remains the same when it comes to Israel and the Jewish people. God's truth doesn't conform to the cultural changes of the world; instead, it redeems it. And that's what we're all about here at the Friends of Israel. Friends, I want to ask that you get behind this ministry, that you pray for us. Pray that the Lord will open opportunities to expand our ministry. If you believe Israel and the Jewish people still matter today because of what the Scriptures teach, and you believe that it's important for people to know this truth, then I ask that you pray that God will expand this ministry. And another way you can help expand this ministry is by giving. Friends, I want to encourage you to give and support the Friends of Israel Today. Your support helps to advance the message to the church and beyond that God has a unique plan for Israel and the Jewish people, and that their existence today, the fact that you can shake a Jewish person's hand or that you can get on a plane and go visit Israel, is a testimony to the faithfulness of our God. To give, go to foiradio.org. There's a donate link right on our home page. And I also want you to be sure to stick around so that you can hear about more ways that you can give to the Friends of Israel Today. Steve Conover: Thank you, Chris. We've been talking today about our radio ministry and the need for support for it to continue. Would you prayerfully consider being a regular supporter of this radio ministry? You can financially support the Friends of Israel Today radio program by visiting foiradio.org. That's foiradio.org. Call our listener line at 888-343-6940. Again, that's 888-343-6940. You can send your donation by mail to FOI Radio P.O. Box 914, Bellmawr, New Jersey, 08099. Every once in awhile we like to highlight ministries here at The Friends of Israel Gospel Ministry. From our free medical clinic in Argentina, to our Bible camps in Eastern Europe, to supporting pastors in Israel, we are striving to bring hope to Jewish people all over the world. This week we want to focus on our radio ministry. Because of you, our listeners and supporters, we are able to bring sound, biblical teaching and news about Israel and the Jewish people to over 500 stations in the United States and Canada and to podcasters all over the world! What a blessing! Our host and teacher, Chris Katulka, was invited a few weeks ago to a special conference in Jerusalem hosted by Israel’s Government Press Office called, “The Christian Media Summit.” Israeli leaders met and spoke to the group of journalist about current events and to thank them for faithfully supporting the State of Israel. Chris will highlight some of those meetings and share with you the message they wanted you, never-ending supporters of Israel, to hear. It is an important message that will cause you to love the Jewish people and State of Israel even more! And we want to be sure that you know: The Friends of Israel Today radio is a listener supported radio program. We are only able to be on the air because of faithful givers like you. If you have never become a financial supporter of the ministry will you consider giving today? We would love for you to partner with us as we teach biblical truth in changing times! While most Christians will never have the opportunity to travel to Israel, there is another way to express your friendship and support for God’s Chosen People, by assisting them with their needs. At a time when so many in this world are turning away from Israel, we can turn toward them and surround them with Christian love. We at The Friends of Israel offer many projects to support the Jewish people all over the world through our gift catalog. The gift catalog gives you an opportunity to express your friendship and love to the Jewish people. If you would like to support a project visit our catalog page!